Vitiligo is a chronic skin disorder presenting with depigmentation, the pathogenesis of which is complex but the autoimmune theory is now preferred. Multiple immunologic processes, including stimulation of the T-helper (Th)1 response, formation of autoreactive melanocyte-specific CD8+ T lymphocytes, a decrease in the blood concentration of T regulatory (Treg) cells, and an increase in interleukin (IL)-17 and interferon (IFN) concentration, have been shown to contribute to vitiligo progression and maintenance. The aim of this study is to evaluate the influence of simvastatin and atorvastatin on vitiligous lesions in patients with nonsegmental vitiligo (NSV). According to available data, statins act through several immunological pathways, potentially reversing undesirable phenomena underlying autoimmune vitiligo pathogenesis. A study has been designed as a single-center, randomized, double-blind, placebo-controlled pilot study with the enrollment of at least 24 active NSV patients presenting with vitiligous lesions on both upper and lower limbs. The clinical effects of ointments containing 1% simvastatin-acid sodium salt or 1% atorvastatin calcium salt applied on a preselected limb will be assessed in comparison with vehicle ointment applied on the opposite limb. All study participants will undergo clinical evaluation using body surface area (BSA) and Vitiligo Area Scoring Index (VASI) scales at baseline and at weeks 4, 8, and 12 time points. A precise assessment of skin lesions will be performed using photographic documentation obtained during each study visit and processed with NIS-Elements software. Currently available vitiligo topical therapeutic approaches including calcineurin inhibitors and corticosteroids remain poorly effective and are associated with either relatively high cost or potentially dangerous adverse effects. The clinical application of orally administrated statins, widely used as systemic cholesterol-lowering agents, in vitiligous patients has only been tested in two clinical trials; however, data on their potential usefulness is scarce. Moreover, due to a high risk of clinically significant toxicity, topical administration was recommended by researchers. This study is the first to evaluate safety and efficacy of the topical use of statins in patients presenting with NSV. Clinicaltrials.gov, NCT03247400. Registered on 05 August 2017. Vitiligo is a chronic dermatosis with an incidence in the general population ranging from 0.5 to 1.0%. It is associated with the occurrence of depigmented skin lesions that appear due to melanocyte destruction. The etiology of vitiligo comprises genetic and autoimmune predispositions, as well as biochemical, neurochemical, and environmental factors. Until now, the autoimmune hypothesis of vitiligo etiology seems to be the most preferred [1, 2]. Skin and blood of patients with an active form of vitiligo is abundant with autoreactive, melanocyte-specific CD8+ T lymphocytes, which are considered to be critical and sufficient for the initiation of depigmentation [3, 4]. Active CD8+ T lymphocytes produce interferon (IFN)-γ which, accompanied by tumor necrosis factor (TNF)-α, represents the cytokine profile characteristic of a T-helper (Th)1 cell response. The stimulation of a Th1 response plays a pivotal role in the pathogenesis of vitiligo. It has been shown that the chemokine IFN-γ axis in murine models with focused vitiligo is crucial for both progression and maintenance of vitiligous lesions [5–7]. Statins, acting directly on melanocyte-specific CD8+ T lymphocytes, lead to their limited proliferation as well as to decreased IFN-γ production in murine vitiligo models [7, 8]. Additionally, the pathogenesis of vitiligo is associated with a decreased skin concentration of interleukin (IL)-10, which belongs to the family of Th2-dependent cytokines [9, 10]. As a result of the actions of statins, a noticeable increase in anti-inflammatory cytokine (IL-4, IL-5, and IL-10) secretion can be observed. Moreover, a shift to a Th2-dependent response occurs [11, 12]. IL-17, a cytokine that stimulates production of TNF-α, has been reported to be present in higher concentrations in the serum and tissue in vitiligous patients. Vitiligo maintenance has also been proven to be associated with an increased IL-17 concentration . Another cell population that plays an important role in pathogenesis of vitiligo is T regulatory lymphocytes (Treg). It has been found that a decreased peripheral blood concentration of Tregs, as well as their impaired activity, are responsible for an enhanced destruction of melanocytes. As a result of statin use, inhibition of T cell differentiation into Th-17 cells secreting IL-17 can be observed. Furthermore, the process of differentiation into the Treg subpopulation potentiates. These phenomena result in inhibition of inflammatory processes and lead to immunotolerance [14, 15]. Statins have also been found to cause lymphocyte anergy. According to the available data, the impairment of lymphocyte migration as well as a reduced influx to the inflammatory site underlie this condition [16, 17]. On the basis of all the presented pathogenetic mechanisms of acquired vitiligo, we hypothesized that the use of statins may be beneficial for the development of vitiligous lesions and the appearance of repigmentation. Thus, we designed a study aiming to evaluate the influence of topical statin use on repigmentation in patients suffering from nonsegmental vitiligo (NSV). The study has been designed as a single-center, randomized, double-blind, placebo-controlled pilot trial. The study period has been set between October and March to eliminate any potential positive influence of sunlight on vitiligous lesion repigmentation. Recruitment started on 1 December 2016. The study end date is anticipated to be 30 April 2019. The study population will comprise patients with the NSV acrofacial active form of vitiligo. Upper and lower limb involvement is an obligatory inclusion criterion in screened patients. A total number of at least 24 enrolled patients is planned for the study. All enrolled participants will apply ointment including 1% simvastatin-acid sodium salt onto a preselected limb and vehicle ointment onto an opposite limb and 1% atorvastatin calcium salt ointment onto another preselected limb and vehicle ointment onto an opposite limb, taking into account different combinations as presented in Fig. 1. Such a scheme of ointment administration allows a direct comparison of the effects of active substance and placebo due to the identical biological model and a similar area of vitiligous lesions. The simvastatin-acid sodium salt was obtained from the Department of Organic Chemistry, Nicolaus Copernicus University, Collegium Medicum in Bydgoszcz, according to a previous publication with modifications . The initial studies performed in The Department of Pharmaceutical Technology, Nicolaus Copernicus University, Collegium Medicum in Bydgoszcz, revealed that 1% simvastatin-acid sodium salt and 1% atorvastatin calcium salt can permeate through stratum corneum and reach the stratum basale of the epidermis. The evaluation of the permeability of active substances through the skin was performed in diffusive chambers, taking into account their lipophilic structure and appropriately low molecular weight. Ointments with active substances as well as vehicle ointments will be prepared using an absorption base with the addition of a sorption promotor in The Department of Pharmaceutical Technology. Ointments will be prepared using an Unguator mixing device and they will be placed in polypropylene/polyethylene sterile containers to achieve at least 30-day chemical stability and sunlight protection. After production, study substances will be delivered to the Clinic of Dermatology, Sexually Transmitted Diseases and Immunodermatology, Nicolaus Copernicus University, Collegium Medicum in Bydgoszcz. During the screening visit all patients will undergo blood sample collection to assess the following parameters: peripheral blood morphology, creatine kinase (CK), aspartate aminotransferase (AST), alanine aminotransferase (ALT), creatinine, estimated glomerular filtration rate (eGFR), blood urea nitrogen (BUN), C-reactive protein (CRP), lipid profile, serum glucose, parathormone, cortisol, thyroid stimulating hormone (TSH), free triiodothyronine (fT3), free thyroxine (fT4), antithyroglobulin antibodies, antithyroid peroxidase antibodies, anti-Treponema pallidum antibodies, and antinuclear antibodies (ANA-HEp-2). The laboratory test assessment aims to evaluate each patient’s current metabolic status as well as potential coexistence of autoimmune disease or infection. After the screening visit, four visits will be scheduled for all enrolled participants (baseline at week 0, week 4, week 8, and week 12). Each visit will include the evaluation of vitiligo severity using the numerical scales body surface area (BSA) and Vitiligo Area Scoring Index (VASI). Photographic records of vitiligous lesions obtained during each visit will be processed using NIS-Elements software for detailed lesional skin area measurements. All visits will be held in the same clinical study room, and photos will be taken with a Nikon D5500 camera under similar conditions. At each visit, the participants will be provided with a set of containers including study drugs. The weight of each container will be recorded at the moment of dispensing and after a 30-day period of ointment application. 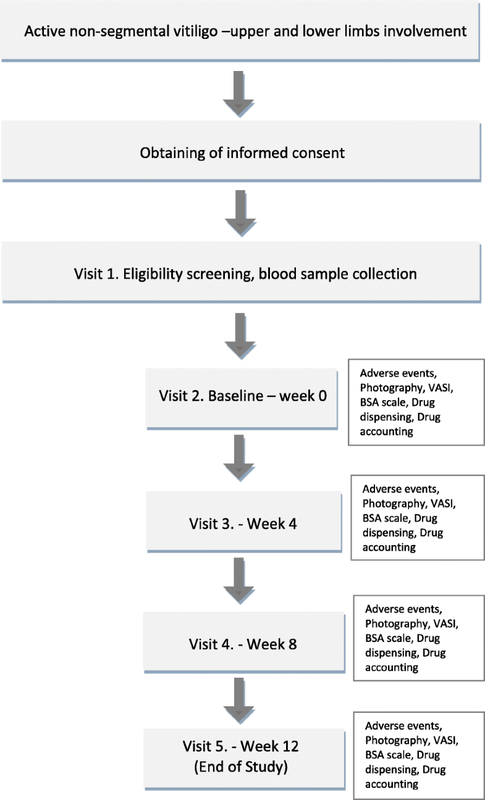 The patient flow chart throughout the study and EVRAAS study schedule are presented in Figs. 2 and 3, and the complete SPIRIT checklist is provided in Additional file 1. All study procedures will be conducted with full respect for the regulations included in The Declaration of Helsinki as well as in Good Clinical Practice Guidelines. According to the study protocol, adult patients of the Clinic of Dermatology, Sexually Transmitted Diseases and Immunodermatology, Nicolaus Copernicus University, Faculty of Medicine in Bydgoszcz, diagnosed with active form of acquired nonsegmental acrofacial vitiligo will be screened for eligibility. Any study-related procedures will be undertaken only after obtaining informed consent from each participant. The main inclusion criteria include male or nonpregnant female (based on female patient declaration) patients aged 18–80 years with a clinical diagnosis of active NSV acrofacial vitiligo with obligatory upper and lower limb involvement and provision of an informed consent form. An active form of vitiligo is defined as the appearance of new areas of depigmentation or progression of existing areas of depigmentation within 3 months preceding screening. Major exclusion criteria include pregnancy or breast-feeding, diagnosis of segmental, mixed, or undefined vitiligo, hypersensitivity to simvastatin or atorvastatin, the use of any systemic statin, azathioprine, methotrexate, mycophenolate mofetil, Janus kinase (JAK) inhibitors, or any investigational drug within 8 weeks preceding screening, and the use of cyclosporine A, systemic corticosteroids, phototherapy, or any other topical or systemic vitiligo treatment within 4 weeks preceding screening. The complete list of inclusion and exclusion criteria is presented in Table 1. All enrolled patients will receive four containers with the following ointments: 1% simvastatin-acid sodium salt, 1% atorvastatin calcium salt, and two vehicle ointment-filled containers labeled with a preselected limb as follows: “left upper limb”, “right upper limb”, “left lower limb”, and “right lower limb”. In each case, application of an active substance to a particular limb is associated with application of the vehicle ointment onto the opposite limb as previously described. The exact description of the randomization process is presented below. Study participants will apply ointments twice daily (every 12 h) according to the container labels. An approximate amount of 1 cm of ointment is advised for palm-sized lesions. Study drugs must be stored at room temperature. During the study period, participants are not allowed to initiate treatment with systemic statins due to any other medical conditions. In case of a necessity to start statin uptake during the study period, the patient’s participation will be prematurely terminated. Moreover, administration of any other topical active substances on lesional areas is forbidden throughout the study period. The systemic use of any immunosuppressive or immunomodulating medications, as well as laser therapy or phototherapy, is not allowed throughout the study. Participants are not allowed to use any other additional vitiligo treatment, either systemic or topical, including the use of antioxidants, Ginkgo biloba, or dermocosmetics. The study period was defined as 12 weeks. The visit schedule includes a screening visit, when all necessary data including blood sample results will be gathered, baseline (week 0) and three evaluation visits every 4 weeks (week 4, week 8, and week 12). During each visit all participants will be provided with a new set of previously weighed study drugs. Previously distributed containers need to be returned at each visit, and their final weight will be recorded in the study documentation after return. Photographic documentation of vitiligous lesions will be recorded during each visit. Sunbathing is prohibited throughout the whole study period. Randomization of study participants into the arms was performed using Random Allocation Software version 1.0. The study was designed as a double-blind trial. The preparation of study drugs, as well as the process of blinding, was performed by the Department of Pharmaceutical Technology, Nicolaus Copernicus University, Faculty of Pharmacy in Bydgoszcz. The study drugs are delivered in identical containers labeled with the consecutive participant number and an assigned application area, i.e., “left upper limb”, “right upper limb”, “left lower limb”, or “right lower limb”. The weight of all containers is identical at the moment of delivery. Organoleptic properties, including color, consistency, tenacity, and smell of the studied ointments are highly similar, thus making the substances indistinguishable for both participant and investigator. The primary outcome of the study was defined as the evaluation of repigmentation of vitiligous lesions achieved after the administration of 1% simvastatin-acid sodium salt or 1% atorvastatin calcium salt ointments compared with vehicle ointments after a 12-week study period. Repigmentation will be assessed according to VASI and BSA scales based on photographs obtained during each visit using planimetry software as mentioned above. Secondary outcomes of the study comprise safety and tolerability of the study drugs, assessed as the number of participants with treatment-related adverse events according to Common Terminology Criteria for Adverse Events (CTCAE) version 4.0, the percentage of patients who achieved particular response rates (none, 0%; poor, 1–25%; moderate, 26–50%; good, 51–75%; excellent, > 75%) in each arm assessed as a relative reduction in lesional skin area, as well as with the BSA and VASI scale, a comparison of simvastatin and atorvastatin efficacy between study participants, the association between disease duration and repigmentation rate in the study arms, and the association between estimated daily ointment use (grams per square centimeter of skin) and the repigmentation rate in study arms. The complete list of study outcomes is presented in Table 2. 1. 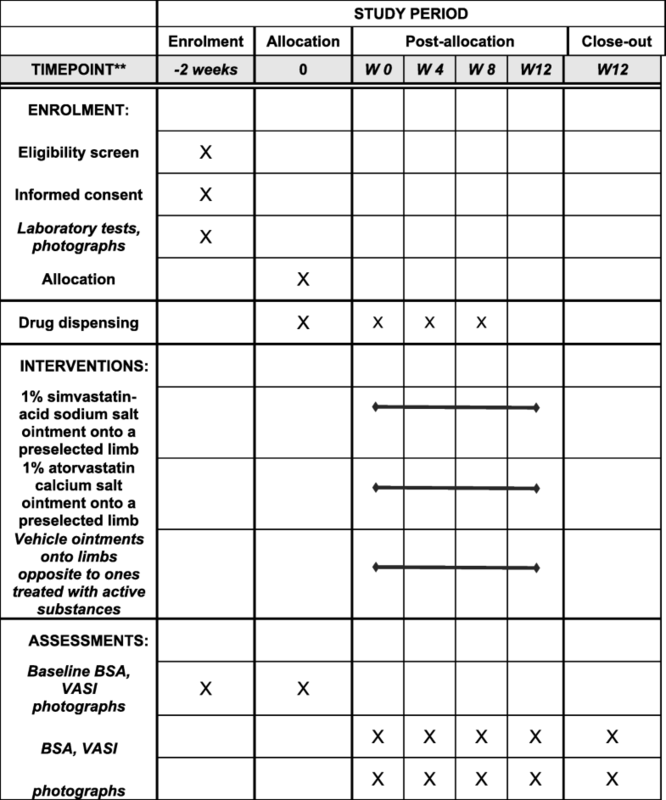 Evaluation of repigmentation of vitiligous lesions achieved after the administration of 1% simvastatin-acid sodium salt or 1% atorvastatin calcium salt ointments compared with vehicle ointment after a 12-week study period (change from baseline in repigmentation on BSA and VASI scale). The study has been designed as a pilot study aiming to enroll at least 24 patients. After the enrollment of a predefined group of participants, an interim analysis will be performed to define a desirable group of patients needed to evaluate the aforementioned study outcomes. Statistical analysis of all data obtained throughout the study period will be performed. Initially, baseline population characteristics will be analyzed to evaluate potential imbalances between study arms. Data obtained from at least 24 consecutive participants will be processed using appropriate statistical models to evaluate findings regarding study primary and secondary outcomes. Main statistical analyses will be performed using analysis of variance (ANOVA) repeated measures with time effect and placebo-drug effect (right versus left side of the body). The statistical significance of differences between groups will be estimated using analysis of contrasts. The study protocol has been approved by The Ethics Committee of Nicolaus Copernicus University in Toruń, Ludwik Rydygier Collegium Medicum in Bydgoszcz (approval number KB 597/2016). The study was funded by Nicolaus Copernicus University (grant NCU no. 631). No external funding was granted. The treatment of vitiligo remains poorly effective and is still a great challenge for dermatologists. Thus, numerous clinical studies aiming to develop a drug that inhibits vitiligo progression and induces skin repigmentation are currently ongoing. Acral depigmentation is considered to be particularly difficult to treat. Methods for topical treatment of vitiligo are still limited. Topical substances commonly used to treat vitiligo include corticosteroids and calcineurin inhibitors . Chronic use of topical calcineurin inhibitors is associated with a relatively high cost, which is unaffordable for a noticeable number of patients. Moreover, the efficacy of calcineurin inhibitors is limited. The best effects of treatment with calcineurin inhibitors were reported in patients applying them on facial and neck lesions . Topical corticosteroids, although significantly cheaper, may induce various adverse events if applied chronically. This in turn may result in an increase of therapeutic costs due to the required treatment of adverse effects. Preparation of statins ointments is a low-cost process. Taking into account estimated the positive safety/tolerability profile of topical statins, these agents may turn out to be a potential alternative for current vitiligo topical treatment. Patients treated with other nonsurgical methods such as phototherapy (narrow band UVB 311 nm, UVA, PUVA-therapy), 308 nm laser therapy, administration of antioxidants, Ginkgo biloba, or systemic immunosuppressive agents (e.g., methotrexate, corticosteroids) or combination therapies often do not achieve desirable improvement. The use of statins is associated with an increase in anti-inflammatory cytokine secretion and inhibition of proinflammatory cytokine production, as well as with a shift from a Th1- to Th2-dependent immunological response as described above. Taking into consideration the postulated immunological pathogenesis of vitiligo it becomes a rationale for potential implementation of statins for its treatment. Until now, topical administration of statins in various medical conditions including wounds, dry-eye, pressure ulcers, and chronic periodontitis has not been associated with serious adverse events [21–24]. Overall, due to the proven pleiotropic and anti-inflammatory effects of statins, as well as their positive safety profile, good availability, and low cost of production, vitiligo treatment with statins may be a promising approach. Until now, two studies evaluating the effects of systemic statins in patients with vitiligo have been performed. The results of the study by Vanderweil et al. revealed no clinical improvement regarding BSA and VASI in the simvastatin arm. However, only five patients in the simvastatin arm completed the study. Moreover, the results of one patient who developed inflammatory vitiligo noticeably influenced the outcomes. The authors of this study suggested topical use of statins as potentially safe and effective in vitiligo . The results obtained from our pilot study may be used to assess the reasonability of further investigation regarding the issue, for example larger clinical trials. The study is currently recruiting participants. We would like to thank the nurses working in the Clinic of Dermatology, Sexually Transmitted Diseases and Immunodermatology for collecting blood samples required in the study protocol. The study was funded by Nicolaus Copernicus University (grant NCU no. 631). No external funding was granted. Supporting data are unavailable to protect participant identification details. TK was responsible for obtaining simvastatin-acid sodium salt. AW and JK prepared the ointments containing active substances and vehicle, as well as performing the process of randomization and blinding. BK was responsible for statistical analysis. AN and RC were responsible for screening, enrollment, and conducting all study-related procedures. AN, RC, TK, AW, JK, and BK contributed to editing the manuscript. All authors read and approved the final manuscript. The study protocol has been approved by The Ethics Committee of Nicolaus Copernicus University in Toruń, Ludwik Rydygier Collegium Medicum in Bydgoszcz (approval number KB 597/2016). All study-related procedures can be performed only after obtaining written informed consent from the participants.